There seems to be a broad consensus in our culture that medicine stands at some kind of perilous crossroads. Medical technology of all kinds, including some that were heretofore imaginable only in science fiction, is evolving at an astonishing rate, holding out great promise for earlier and more exact diagnosis and for new cures, therapies, and microsurgeries. In this sense, you might say that the state of medicine has never been healthier. And yet in spite of this astounding technical proficiency, or perhaps also because of it, people are justly worried. The technological evolution of biology and medicine has made it possible to do things to ourselves and our posterity that we do not know how to think about, and that many of our contemporaries apparently do not want to think about. Every few weeks, we are presented with what seems like a new bioethical quandary made possible by our technological expertise. There are other issues as well, not unrelated. Medical costs are out of control, especially where the quality of medical care is poorest. Nobody seems to know how to tame them, and some experts even suggest that the problems are so intractable, and the center-less system so vast and complicated, that it cannot be fixed. Medical professionals find themselves under constant pressure from forces external to medicine itself: pressure to maximize efficiency, pressure to minimize liability, pressure to see more patients, pressure to see fewer patients, and layer upon layer of administrative oversight. Many of the medical professionals I’ve talked to express a sense of frustration and helplessness about all this. This sense can be even more acute for patients, as the experience of submitting oneself to the vast labyrinthine workings of industrialized medicine and its administrative apparatus can often compound the already dehumanizing experience of being ill.
And yet even in the face of all these misgivings, many in our society seem to hold an almost blind faith in the progressive power of medicine, expecting it to cure every personal and social malady, cater to every desire, and enhance our very humanity. And of course such hopes and expectations only fuel the engine of unrestrained biotechnical development, which proceeds on its course, in Hans Jonas’ image, like a ship navigating with its landmark tied to its own bow. All of this has given rise to a great deal of confusion and to radically competing visions of what medicine ultimately is and is for, creating for medicine – at least medicine as we have known it – something of an “epistemological” and perhaps indeed even an existential crisis. There are real grounds for concern that the art of medicine may be overtaken entirely by the science of medicine, that the science of medicine may be overtaken, in turn, by thebusiness of medicine, and that the business of medicine may collapse under the weight of social, economic, and demographic pressures and its own internal contradictions. Catholics in medicine have their own special reasons for anxiety. In the 2010 special election to fill the Senate seat left vacant by the death of Ted Kennedy, candidate Martha Coakley, the Massachusetts attorney general, opined on a radio show that maybe people with Catholic convictions shouldn’t work in emergency rooms. It turned out that Coakley had a special talent for ill-advised remarks, and this one was quickly shot down along with her election chances; yet the incident left many Catholics with the sense that Coakley had inadvertently revealed the thinly veiled sentiments of much of secular America and perhaps even the current government. Needless to say, subsequent actions by the government have not been reassuring. Yet, what I think is most striking about such sentiments is not their hostility, which should really come as no surprise, but rather their historical ignorance and superficiality, as if all these hospitals with saint’s names affixed to them just dropped out of the sky. And if Coakley does in fact speak for our emerging post-Christian culture, it betokens a grave crisis indeed. The Orthodox theologian David Bentley Hart makes gets at a similar point when he notes the sheer intellectual un-seriousness of the so-called New Atheists, who, cheerfully reveling in their ignorance of both philosophy and history, seem to think it possible to erase the memory of Christianity from the culture without losing much else that is important besides. Sensing a cultural sea-change, and feeling themselves the object of scorn and incomprehension in an age which is not simply secular, but historically and philosophically post-Christian, American Catholics seem palpably anxious to carve out a “me-too” place for themselves within medicine, a place where they are free to practice medicine according to the peculiar shape of a Catholic conscience, however unintelligible that may now be within the larger culture. In contrast to this, I raise this Nietzschean observation first to suggest that while this reaction is understandable, and perhaps all we can reasonably hope for given our cultural situation, it is not adequate either to secure the viability of Catholics in medicine over the long-term or to address what is really at stake in this crisis. I raise it, second, to introduce the animating assumption of this essay, which I will come to in due time. Suffice for now to say that we need to re-frame the question in light of a deeper and more comprehensive understanding of what is at stake. There are of course many ways in which the history of Western medicine could be and has been written, each of which contains fundamental assumptions about the nature and purpose of medicine itself. There is what has been called the “great men in white coats” school of medical historiography, which was dominant until just recently. One could read the history of medicine as the history of medical technology, and indeed important work has been done showing how revolutionary inventions from the stethoscope to the x-ray machine, artificial kidneys, and respirators have transformed not only clinical practice, but what Foucault called “the medical gaze,” the frame through which medicine views, categorizes, and problematizes the human body, health, and disease. Taken to its logical conclusion, this gaze culminates in the new “genetic” and “clinical” understanding of the human person and society according to which, in the words of Richard Lewontin, “the model of cystic fibrosis is the model of the world.” Or, relatedly, one could tell the history of medicine as Guenter Risse has done, as a history of the hospital and the central images through which we understand it: from its origins as a place of mercy and a refuge for the dying in late Christian antiquity, through its role as a house of rehabilitation during the Renaissance and a place of cure in the eighteenth century, to a center of teaching and research in the nineteenth century, surgery after 1850, advanced science in the early twentieth century, and high technology in the late twentieth. And one could consider how each of these focal images reflects profound changes in the underlying assumptions of the surrounding culture. Each of these perspectives on medicine is a legitimate aspect of the overall picture, and each would show us in historical terms what we already know to be true on philosophical grounds: that the history of medicine is not simply a history of institutional development and technical, scientific progress, but that institutional development and technical and scientific progress are always mediated by deep, often unarticulated metaphysical assumptions about the ultimate natures of persons and things. But no history would be adequate to the truth, much less to what is presently at stake, if it fails to consider the ways, both subtle and specific, that Western medicine was nurtured within the bosom of the Church and the Christian imagination. Of course, the Greeks and the Romans, epitomized by Hippocrates and Galen, had a “naturalistic” conception of medicine as well as pagan healing cults such as the cult of Asclepius and, and, indeed, Christian medicine, whose development was encouraged by Sts Basil of Ceaesarea, Gregory of Nyssa, Gregory Nazianzen, and John Chrysostom among others, was by and large an appropriation of Galenic holism, environmentalism, and humoralism. Christian refuges, such as what is now the Basilica of Sts Cosmas and Damian on the Forum of Vespasian in Rome, took up residence in what were formerly pagan temples and shrines. These developments had their roots in the call to charity and in the image of the Christus Medicus, popularized by St Augustine. Yet the fact that Christianity appropriated Greco-Roman secular medicine does not diminish but underscores our culture’s debt to Christianity; for here, as in philosophy, art, and literature, we have Christian charity and universality, the openness to goodness and truth to thank for the preservation of the remnants of classical culture. This is why our anachronistic understanding of “religion,” as a private (and ultimately irrational) compartment of life is such a distorting lens through which to perceive the profundity of Christianity’s contribution to our culture. But even with a relatively developed medical art, “Pagans,” writes Guenter Risse, “lacked a comprehensive religious doctrine that could energize and compel them to consider collective charitable actions.” And so as soon as Christianity emerged fully into the open and assumed social responsibility, new factors were introduced into medicine and its self-understanding. Asclepius, for instance, only served individuals who sought him out, worshiped him, and made offerings, and he offered no eternal salvation. Many pagans avoided contact with the sick, refusing to nurse them, and they would flee their homes and cities in times of famine and epidemic, sometimes even leaving their dead unburied. By contrast, Christians in Edessa, Caesarea, and other places mobilized during such events to create hostels and refuges for the sick and the destitute. By 370 this institution was patronized by the Emperor Valens. By this point, the Church already had become the most important patron of charitable works in the Roman Empire with religious foundations maintaining infirmaries to care for the poor and the sick, and in at least one case in Antioch in the 340s, dedicated to giving specifically medical attention. Thus was inaugurated the long tradition of religious almshouses and hospices that would eventually evolve into the hospital during the Renaissance. 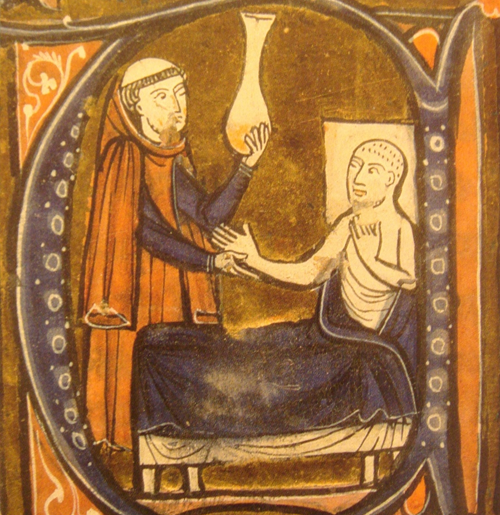 Historians often refer to the medico-religious character of the late hospitals that emerged, especially after the Black Death, as supplying medicine for the body and medicine for the soul. There is of course true in a certain sense. There is, after all, a proper distinction between body and soul which the ancients and medievals would have readily acknowledged, and modern medicine has surely shown us that it is possible to successfully treat the health of the body in abstraction from any considerations about the soul, indeed without acknowledging the existence of soul, which seems to modern thought like a curious relic of a superstitious pre-scientific past. But we must take care not to interpret this through our own inveterate Cartesianism, lest we miss its real significance. In their appropriation of Galenic holism, environmentalism, and humoralism, and their therapeutic use of Galenic “non-naturals” such as music and art, in their architecture, which is scarcely distinguishable from that of the monastery and which sometimes made a provision for the sick in their beds to adore the sacrament, in their role as recipients of artistic patronage, and their prominent place within the liturgical life of their cities, in the structure they provided for the outworking of the religious vocation, and not least, in the impetus that this vocation provided to assist in the ars moriendi and to care in hope for those who stood no chance of physical recovery – in all of this – the very existence of these institutions testifies to an understanding of the of the person that is more than a machine or an “autocatalytic dissipative system,” an understanding of his wholeness or unity that is more than a unity of aggregation or organization; more than a psychological or affective ghost tacked onto a machine. The very existence of such institutions is testimony to an understanding of health that is more than mere physical or even psychological homeostasis, an understanding of care that is more than cure, and an understanding of the medical vocation that is more than a career. Between 1829 and 1900, Catholic sisterhoods established 299 hospitals nationwide and really helped give birth to the modern profession of nursing, until the role of the sisterhoods in nursing came under scrutiny during the Progressive era and nursing was “professionalized” in the modern sense of the term. The Mayo Clinic is one of these, along with its sister institution, St Mary’s Hospital, founded by the Mayo Brothers in the wake of a devastating tornado at the behest of the Franciscan sisters who raised the funds for it, staffed it with nurses and administered it for many years. Sadly, just as I was writing this essay it was announced that the Catholic designation is being removed from St Mary’s Hospital and that it will now be merged with its Methodist neighbor to become Mayo Clinic Hospital, Rochester. Now I am no historian, and I do not wish to suggest that this history is all glory and light, or that the advent of scientific medicine hasn’t brought about a giant advance in the efficacy of medicine. That would be foolish to the point of unmeaning. Though neither do I wish in acknowledging this point to indulge the triumphalist attitude of modern historiography toward premodern medicine and the early hospital, which is sometimes denigrated as the place where people went to die. In fact we are more likely to die in a hospital than our medieval and renaissance ancestors, so we can say with some justification that it is the modern hospital where people go to die, and we can ask with equal justification whether in comparison those who undergo the experience are likely to be more or less contemplative, more or less at peace, more or less alone. What I do hope is that I have offered enough evidence to justify the assertion that Western medicine owes a great deal to the Christian imagination, more perhaps, than we can ever fully say or appreciate, because Christianity’s contribution to the shaping of Western culture cannot be easily segregated into a religious compartment and dismissed. This is a consoling thought, on the one hand, for perhaps it means that this inheritance, which is truly human as well as Christian, is so deep in the bones of medicine and the culture that it can never be squandered entirely. And yet, on the other hand, it requires us to acknowledge that we this inheritance cannot be renounced or forgotten without losing a great deal of what has heretofore constituted our humanity, and the humanity of Western medicine. Certainly Nietzsche didn’t think so. And recognizing this we see what is really at the bottom of this contest between conflicting visions of the health and medicine: “What is man, that though art mindful of him, and the son of man, that though visitest him?” Underlying these competing understandings of the nature of medicine and health, in other words, are competing fundamental anthropologies, competing visions of who and what the human being is, or indeed whether he is finally anything at all but the coordinated interaction of his physical parts and the and the sum of the antecedent causes that produced him. Pope Benedict understood that this is precisely what is at stake in the survival of an intelligible sense of creation in our technological society. The question, he said, is not simply whether God exists, but whether human beings do. Contemporary medicine is on the frontlines of this question, where, one way or the other, it will be answered in practice. I said previously that we need to re-frame the question, and here we confront this point again, along with the assumption that animates this reflection. The most urgent question in the current situation is not what place is there for Catholicism within modern secular medicine – after all, the Church does not exist for itself but for the world – but rather, what will become of medicine when its Christian origins and spirit have been forgotten? We can of course hope in the basic goodness of humanity and the good will that continues to motivate the many good people who give their lives to medicine. But is there any guarantee that a culture at war with the foundations of its good will can sustain the humanism necessary for sacrificial and humane care? Can a culture lacking a transcendent horizon or a redemptive understanding of suffering long endure the presence of the suffering among us? Is there any principled theoretical limit to a reductive biology? Is there any principled moral limit capable of resisting the technological imperative, the new eugenics, or the pressure to maximize efficiency? Can “professionalism” substitute for “vocation”? Can “professional standards” and physician “self-care” replace spiritual discipline? These are extremely difficult questions, and we face enormous obstacles in thinking about them clearly, much less in providing efficacious answers to the problem they denote. The culture that sustained and was sustained by this religious endeavor no longer exists, and the theological and anthropological assumptions which animated this work, though they are still operative in some sense in the fragments we now possess, are no longer part of our cultural common stock. We are all aware of the depressing demographics, and we know that, barring a miracle, many of the orders that founded these institutions will cease to exist within our lifetimes, necessitating that Catholic medical institutions be sold to secular management or that its Catholic identity be entrusted to lay “review boards.” And even where that is not the case, the “Catholic identity” of many Catholic institutions is often a shell of its former self, having gone the way of the religious identity of most of our once Christian universities: incrementally sacrificed on the altar of cultural assimilation and social respectability, professionalism, and guild accreditation and licensing standards. All of these trends appear to be irreversible, at least in the near term. But the obstacles within are perhaps even more daunting than the obstacles without. As children of the modern West and heirs to the whole, complex history of Western medicine, we are the recipients both to the classical and Catholic conception of the person as an indivisible unity of body and soul, acorpore et anima unum and its corresponding understanding of medicine as an art and to the mechanistic ontology of modernity, which imagines the human organism as a machine or an “autocatalytic dissipative system,” and its corresponding understanding of medicine principally as a technological science. The practical result is that care of the person, as a per se unum of body and soul, tends to be delegated to the priest, to the counselor, to family members, or other agents fundamentally external to medicine as such, and often somewhat marginal within the institutional organization of medicine. It may even be delegated to the physician qua concerned Christian or compassionate human being. But it is not a concern of the physician qua scientist, because we cannot see what difference such notions might make to a scientific understanding of health and disease, even though a full accounting of the unity and integration of the human person permanently eludes the grasp of reductive science. In a particularly acute way, this problem exemplifies what Nietzsche meant when his madman declared that God is dead and we have killed him, and when the people in the market place responded with incredulity, derision, and laughter. It is not that we have somehow disproved God. It is rather that we have come to understand the world in such a way that we can no longer see what difference God’s existence or non-existence might make to it. If this is an accurate diagnosis of the factors underlying our cultural anxiety about medicine, then we will have to take a hard headed look at “the signs of the times,” and we will have to think more rigorously about what it means to integrate spirituality and medicine and why it is important. If this is diagnosis is accurate, then whatever contribution that religion can still make to medicine in this post-Christian culture will consist not simply in deeper compassion or greater interpersonal communication – doctors being willing to talk to patients about God, for example. All of this is good and salutary, but it is not enough to prevent the further fragmentation of medical practice or to delay the arrival of the brave new world already on the horizon. If this diagnosis is correct, then the physician’s task in bringing faith to bear on medical practice will consist, in the first instance, in being a better physician, and this in turn, will require an even more comprehensive and humanistic approach to medical education, as if med students didn’t already have enough to do. It will entail acquiring a more critical appreciation of the philosophical presuppositions of medical science, and a deeper and a more comprehensive vision of the medical art and of the patient. No doubt there is a first-person dimension to making medicine more human. Western medicine, as we have seen, was nurtured within the bosom of religious life, and it is doubtful that professional competence can substitute for the interior life which that discipline sought to cultivate. Nor do I suspect that physicians can long bear the awesome burden of the secular priesthood that our culture has thrust upon them in its quest for medical salvation without cultivating such a life. This burden, I recognize, demands a discipline no less heroic than that faced by earlier generations and maybe more so, given the temptations of our culture and the enormous power that comes with this responsibility. But the crisis of confusion currently besetting modern medicine is not just a crisis of morality or spirituality, even in this more rigorous, ancient sense, but a crisis of truth: the truth of who and what the human being is. And if he is indeed a person, a per se unum of body and soul, then that truth must permeate the whole of his being, in all its dimensions, including his physiology and biology, and it must be visible, in principle, even to the scientific gaze. This means that the task which physicians and other medical professionals face in integrating spirituality and medicine is a task they must confront not justqua compassionate human being, but qua nurse, qua physician, qua scientist. This task is not just spiritually demanding but intellectually and scientifically demanding, and consists in nothing less than making the human person, in his physiological and biological dimensions, visible once more to the eyes of medicine. And yet the threat of a technico-medical juggernaut turned inhuman presents not only an enormous obstacle, but also an enormous opportunity for Catholics working in medicine to do just that. Should they succeed even in witnessing to the truth of the person in all its fullness, it would demonstrate – not for the first time – that the Death of God is not the final word. Hans Jonas, Philosophical Essays: From Ancient Creed to Technological Man (New York: Atropos Press, 2010), p. 81. For more on this crisis and confusion, see Leon Kass, Toward a More Natural Science: Biology and Human Affairs (New York: The Free Press, 1985), pp. 157-86. Nietzsche, The Gay Science, trans. by Walter Kaufmann (New York: Vintage Books, 1974), p. 125. David Bentley Hart, Atheist Delusions: The Christian Revolution and Its Fashionable Enemies (New Haven: Yale University Press, 2009), p. 16. See Stanley Joel Reiser, Technological Medicine (Cambridge University Press, 2009); Foucault, The Birth of the Clinic: An Archaeology of Medical Perception, trans. A.M. Sheridan Smith (New York: Vintage Books, 1994); Keller, “Nature, Nurture, and the Human Genome Project,” Richard Lewontin,Biology as Ideology: The Doctrine of DNA (New York: HarperCollins, 1991). See Richard Lewontin, Biology as Ideology: The Doctrine of DNA (New York: HarperCollins, 1991), p. 75. Guenter B. Risse, Mending Bodies, Saving Souls: A History of Hospitals (Oxford University Press, 1999). Hart, Atheist Delusions, p. 16. See Risse, Healing Bodies, Saving Souls, pp. 69-165; Owsei Temkin, Hippocrates in a World of Pagans and Christians (Baltimore: The Johns Hopkins University Press, 1991), pp. 109-248; Gary B. Ferngren, Medicine and Healthcare in Early Christianity (Baltimore, The Johns Hopkins University Press, 2009); Vivian Nutton “Medicine in Late Antiquity and the Early Middle Ages,” in L. Conrad, M. Neve, V. Nutton, R. Porter, and A. Wear, The Western Medical Tradition: 800 BC to AD 1800 (Cambridge University Press, 1995), pp. 71-88. Risse, Healing Bodies, Saving Souls, p. 83. Risse, Healing Bodies, Saving Souls, p. 80. See John Henderson, The Renaissance Hospital: Healing the Body and Healing the Soul (New Haven: Yale University Press, 2006). See, e.g., Claude Bernard, An Introduction to the Study of Experimental Medicine, trans. by H.C. Greene (New York: Dover, 1957); Jacques Loeb, The Mechanistic Conception of Life (The University of Chicago Press, 1912). Milton J. Lewis, Medicine and Care for the Dying: A Modern History (Oxford University Press, 2006), p. 17. On the unity of organisms and persons and the metaphysical problems in conceiving of it adequately, see Michael Hanby, No God, No Science? Theology, Cosmology, Biology (Oxford: Wiley-Blackwell, 2013), pp. 250-96, 334-74.